Fishing the lower 48 states is excellent, but if you want to tango with some monster trout and salmon, Alaska is where it’s happening. The clean morning air fills your lungs, and 50-pound King salmon turn your dreams of catching a trophy fish into a reality – just don’t let it get away or it will become a nightmare. If you’re looking for an Alaskan vacation that offers an expert guide service and all the first-class amenities of a lavish hotel, look no further. The Northwoods Lodge brings you the finest fishing service, elegant dining and spacious cabins in the midst of Alaska’s beautiful wilderness. The moment you arrive at the Northwoods Lodge you’ll be greeted by your personal fishing guide. At 5 a.m. your guide takes you out your back door and onto Fish Lake Creek. Here you have access to six other creeks filled with rainbow trout, grayling, King salmon, sockeye salmon and more. Unfortunately all good things come to an end, but when it’s time to leave you’ll be surprised to find all your fish filleted, vacuum sealed and frozen for you to take home. Back onshore the Northwoods Lodge continues to outdo itself with world-class amenities. Fill your belly with a five-course dinner, warm up in the sauna or take a dip in the hot tub. To top off your night kick back on your private porch and admire the green pine trees and pristine waters of Fish Lake Creek – you might even spot wandering grizzly bears. The Northwood Lodge is prepared to accommodate corporate conferences and large group meetings. Flights to the Northwoods Lodge depart from Anchorage’s Lake Hood, adjacent to Anchorage International Airport, at 7:30 a.m. and 4 p.m. from Trail Ridge Air. The Northwoods Lodge offers satellite TV and Internet service. Go on an Alaska's Gold Creek Lodge vacation and the only thing you’ll worry about is what kind of fish you should eat for dinner. Come empty-handed, leave with memories (and fish) that will last a lifetime! The Lodge lies incredibly close to Katmai National Park and approximately 280 miles from Anchorage, nestled snugly within the Bristol Bay watershed. Perched on the banks of the world-famous Naknek River in beautiful King Salmon, an all-inclusive experience begins with first-class accommodations.With only 12 to 14 guests at any one time, you know you’ll be getting their utmost attention. Your dedicated hosts will show you the tricks of the trade when it comes to fishing, then you'll hop into a float plane and head out to the southwestern peninsula. The Naknek River is boasted by Fish Alaska Magazine as “the best rainbow trout fishing in Alaska,” so you know there’s fantastic fishing to be done! King Salmon is service and shipment center for the commercial red salmon and sport fishing industries. Coming off a fresh remodeling in 2015, Salmon Falls Resort is an incredibly well-appointed lodge that will entertain as well as enchant. Whether you’re looking for great fishing or great comfort, you’ll find it here. When you arrive at any Alaskan fishing resort, you expect great fishing. But once you leave Salmon Falls Resort, you’ll expect even more. The fish in the surrounding sparkling waters are plentiful, fat, and beautiful. Try your luck at landing a juicy salmon, whether it's a Silver, Coho, Chinook, Pink, Chum, or Sockeye. Should you succeed, not only will you have a delicious meal, but you'll have a fantastic story to tell til the end of your days! Meanwhile, the accommodations are, and I quote, “an exquisite escape from all that is ordinary. A place where time stops and the stars, the mountains and the sea become one”. Why are you not already here?! You can safely ship your fish back to yourself using the major airlines, FedEx or UPS. With an expansive 4,500 square foot dining facility, Timbers restaurant boasts the ability to host up to 160 people. From looking at the monumental Alaska Mountain Range, you'd never guess that such superb fishing was lurking in their shadows. Jimmie Jack's Alaska Fishing Lodges is here to show you what you've been missing out on! The lodge is centrally located on the Kenai Peninsula and provides easy access to a multitude of great fishing destinations, all featuring glorious vistas of Cook Inlet and the Alaska Range. Let's just say that the beauty of Alaska’s coastline won't be lost on you! Once you arrive, you'll be eager to get out on the water (understandably). Jimmie Jack's fleet of 12 vessels go out on the water daily, where you'll (hopefully) catch an assortment of salmon, halibut, lingcod, rockfish and trophy rainbow trout. It's a fisherman's (and fisherwoman's) paradise; what are you waiting for?! The best season to visit would be the summer months of June, July, and August. The capacity for this lodge is 16 to 20 guests. The two biggest fish ever caught at the lodge were a 345-pound halibut and a 76-pound king salmon. Salmon Catcher Lodge is not only extremely self-explanatory- it's a luxurious destination fit for royalty! As one of the Kenai Peninsula’s premier fishing lodges, guest's expectations of Salmon Catcher Lodge are typically sky high coming in, and for good reason. The Lodge features a bevy of gorgeous accommodations, including handcrafted spruce log cabins filled with all the amenities you could ever need. Whether you're a neophyte angler or a veteran trawler, the lodge's fishing guides lead you to some of the best Salmon hotspots in all the great state of Alaska, no problem. Bring your friends, bring your family, but make sure you bring yourself to Salmon Catcher Lodge! There is a free airport and train station shuttle! As you might guess, the waters around the Alaska Rainbow Lodge are filled to the brim with Trophy Rainbow Trout, but it's so much more than that! Featuring easy access to more than 30 different rivers and streams all teeming with fish, a stay at Alaska Rainbow Lodge is one you'll never forget! There's Arctic Char, Silver Salmon, King Salmon, Sockeye Salmon, Grayling and more to be caught, and all can be found across 3,000 square miles of the Iliamna-Katmai watershed into Bristol Bay. Meanwhile, your gorgeous quarters are fit for royalty, and perfectly compliment the spectacular natural surroundings, It's easy to see why guests return to the Rainbow Lodge year after year! Embark on the ultimate fishing extravaganza with Alaskan Fishing Adventures! Located in the heart of Alaska's famed Kenai Peninsula, this outfitting and all-inclusive destination provides you with everything needed for an exceptional fishing experience. Whether you're an expert angler or new to the sport, Alaskan Fishing Adventures helps you plan and enjoy the most incredible outdoor adventures imaginable. Choose from their excellent packages that include everything from lodging to meals, alongside the fishing trip itself. Battle gigantic king salmon, halibut, ling cod, and rainbow trout around the surrounding waters, and bask in the lush nature views. Mix unforgettable fishing excitement with first-class accommodations and make memories in the Alaskan wilderness that will last you a lifetime! 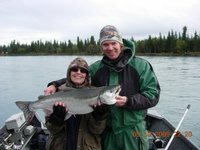 Their professional guides will take you to the best spots out on the Kachemak Bay as well as on the Kasilof and Kenai Rivers if you're interested in freshwater fishing. Cast your line for king salmon, silver salmon, sockeye salmon, halibut, ling cod, trout and much more! Anglers Lodge features a hot tub and fire pit, while Trophy Lodge features a recreation room with pool table, bar, large-screen television, and an outdoor deck. If you seek adventure, why not go for one on the nautical side? Trail Lake Lodge has some of the best fishing this side of the Bering Strait! Get out on the water and cast out for the legions of rainbows, salmon, and halibut! With all-inclusive adventure packages, fishing day trips, and canoe rentals, there are no shortage of ways to facilitate some spectacular fishing. The expert (and hospitable) staff will point you in the right direction, then allow you to get out and wrangle the big one. When you return, you'll be treated to comfortable (and affordable) lodging, framed by the beauty of the Alaskan wilderness. In short, why are you not already here?! Trail Lake Lodge has 22 rooms, each more opulent than the last. You can even be flown into remote mountain lakes and streams for Rainbows and Arctic Grayling fishing! Gwin's offers travelers 15 unique cabins, cottages, and chalets, equipped with full kitchens, separate living and dining areas, lofted bedrooms and bunk beds for the kids, and even a private porch in the Birch Cottage. The comfort of these accommodations keep you coming back year after year, and the lodge continues to improve each of these units to ensure a fantastic experience. Part of the "authentic" Alaska experience is getting out and exploring the natural beauty of the area. Staying at Gwin's Lodge gives you everything you need to enjoy the great outdoors. This is truly a one-stop shop for visitors and locals alike, offering food, lodging, tackle, and anything else you're looking for. Let their experienced guides show you some of the top fishing holes on the peninsula, or do some exploration on a whitewater rafting or kayaking excursion. The Kenai River and Russian River are two of the most popular areas for fly-fishing, and you'll have a great opportunity to reel in a wide variety of trout and salmon. Gwin's is also close to halibut charter services for those looking for a saltwater fishing experience. 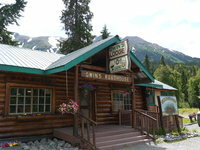 The Lodge offers a number of walk-in and fly-in fishing trips, or you can just do some gold panning, take a fjord cruise or find a spot for bear viewing. Your outdoor adventure is waiting at Gwin's Lodge & Kenai Peninsula Charter Booking Service! Your outdoor fun isn't limited to fishing during a stay at Gwin's Lodge & Kenai Peninsula Charter Booking Service. Try whitewater and scenic rafting, fly-in bear viewing, gold panning, kayaking, horseback riding, or arrange an Alaska Railroad trip. Gwin's Lodge has a full-service restaurant that serves breakfast, lunch, and dinner seven days a week during the travel season. Specialty items include their famous hamburgers, smoked salmon chowder, chili, halibut sandwich, pies, and many other favorites. To find Favorite Bay Lodge you’ll have to venture off the beaten path to a world where nature rules and man is merely a visitor. The saltwater bays and freshwater lakes are brimming with salmon, trout, halibut and humpback whales excited to meet you. The Favorite Bay Lodge is more than an angler’s paradise, it’s a true Alaskan experience. The grassy shore of Admiralty Island is where anglers reel in a variety of rockfish in a peaceful and private atmosphere. The rippling creeks bring you gorgeous views of emerald pine trees and snow-capped mountains. Favorite Bay Lodge is a place where you come to get away from civilization and experience Alaska the way it was meant to be – a tranquil yet untamed wilderness. Favorite Bay Lodge believes in roughing it. Well, only outdoors. The Great Room was designed to capture the spirit of Alaska’s rugged wilderness with large windows overlooking the bay and cedar walls around a sunken fireplace. Your guestroom is themed after Alaska’s native Southwestern wildlife. Picture yourself relaxing on the handcrafted furniture gazing out the window at Mother Nature’s remarkable lofty pine trees, towering mountains, crystal clear water and peaceful wildlife – there’s nothing else like it. Favorite Bay Lodge is located in Angoon and receives 32 inches of rainfall per year. Alaska Airlines is the primary airline serving Southeast Alaska. You’ll fly in to Juneau and be transported to Favorite Bay Lodge by a 45-minute seaplane ride. Favorite Bay Lodge offers one onsite restaurant that serves breakfast, lunch and dinner. Located on the shores of the Kenai River in Alaska, Kenai River Lodge is the perfect destination for your next fishing vacation. Alaska Legends Kenai River Lodge is the ultimate combination of remote yet convenient for any event. The lodge sleeps over 30 people comfortably and is perfect for travelers that want the experience of staying in the great Alaskan outdoors while remaining comfortable. The lodge features a state of the art restaurant-style kitchen, 11 bedrooms with their own bathrooms, and a living area with a pool table, bar, televisions, and a fireplace. The lodge has access to bring you the best fishing guides in the area as well as customized catering services. The Kenai River is the most popular sport fishing destination in Alaska, particularly for salmon and trout. 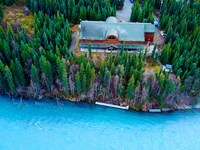 A unique aspect of the Kenai River Lodge is that the property is rented out only as the entire lodge for big groups, not by individual rooms. This means that you and your fishing companions get the whole place to yourselves! The population of Soldotna, AK is 4,659. Some of the amenities the lodge comes with includes an outdoor patio with BBQ grills, wireless internet, and heating. There is no better place to plan your luxury fishing trip in the state Alaska than Deep Creek Fishing Club. From their spacious accommodations and gourmet dining options to their wide variety of fishing trips, you're sure to have an outstanding time. The knotty pine interior of the lodge sets rustic ambiance, but don't be fooled! This is truly a luxurious getaway with breathtaking views, king-size old hickory beds, glowing fireplaces, and more! Fine dining is unparalleled here wither you are enjoying king crab, USDA prime beef, or the catch of the day. You'll also enjoy breakfast delivered to your room daily, which may include a tray of coffee or tea along with freshly baked goods. This mouth watering meal will give you plenty of energy, and you'll need to for all of the fun fishing adventures you'll enjoy during your stay. Deep Creek Fishing Club offers a wide range of fishing options including saltwater, freshwater, fly-fishing, and fly-out adventures. Out of more than 3,000 fresh water streams that dot the Alaskan landscape, Deep Creek has hand picked 40 of the very best, where you'll have a great chance to reel in salmon, trout, steelhead, northern pike, and more. Fly-out adventures will take you withing a 200-mile radius of the lodge, providing your with the ultimate Alaskan adventure. Find remote streams and glacier-fed lakes with the help of your guide, and enjoy a unforgettable getaway! Deep Creek Fishing Club is within driving distance of five salmon streams, including the world-famous Kenai River. This key location affords anglers easy access to Alaska's very best fishing sites. There are an estimated 100,000 glaciers in the state of Alaska, covering three percent of the landscape and creating most of its rivers. Luxury and fishing usually aren't connected to one another, but at Port Lions Lodge they couldn't go more hand-in-hand! Set on the north coast of Kodiak Island, Port Lions Lodge is a luxury fishing lodge that offers comfortable accommodations, first-class dining, and breathtaking views of surrounding Kizhuyak Bay and the Kodiak Mountains. 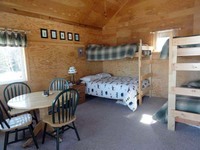 The cabins are comfy, the rooms are cozy, and they're full of things to keep you warm in the harsh Alaskan winter. Grab a rod and cast away for Kodiak halibut, Kodiak salmon, Kodiak rockfish, and Kodiak lingcod. 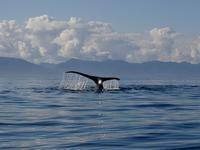 Just remember to keep your eyes peeled for humpback whales, orcas, and sea lions! 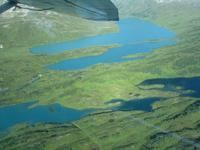 You will fly commercially into the city of Kodiak Alaska at your expense. 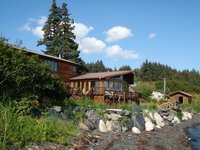 Typical 5 day 6 night clients will be picked up in Kodiak on the Sunday of their arrival at approximately 3:00 PM to 6:00 PM for transport to Port Lions Lodge. 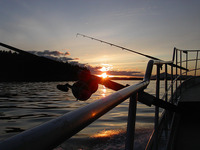 Enjoy the quintessential Alaska fishing vacation on glorious Prince of Wales Island at Sportsman’s Cove Lodge! Consistently ranked among Alaska's best lodges, the Sportsman's Cove Lodge has a commitment to excellence that is unmatched. It's this commitment that explains why 85% of the Lodge's customers have been there before. Mostly it has to do with the fishing, which, suffice to say, is spectacular. A huge variety make the cove their home, from salmon to cod. Whatever you catch can be filleted for you by the Lodge’s expert staff. There’s plenty of other activities to do, including going on a nature hike through Tongass National Forest, but if you're exhausted after a day spent on the water, head back to one of the authentic and cozy luxury cabins and hit the hay. If you love the outdoors Sportsman's Cove Lodge is for you. Prince of Wales Island is the 97th largest island in the world. The insanely luxurious King Salmon Lodge invites all anglers to come enjoy its unique style of vacationing. If ever there was a lodge that encapsulated "rustic luxury", it's King Salmon! It's natural seclusion and rural sensibilities combine with a commitment to the comfort and experience of their guests to create an unforgettable experience, regardless of the occasion. With the immaculate Naknek River as a backdrop, you barely have to step out the door to find exquisite angling. There's a total of five species of salmon you can plumb the depths for, plus trophy rainbows, arctic char, grayling and northern pike to boot. If you're a neophyte angler, there are professional fishing guides onsite to show you the ropes. If the river isn't enough, you can even fly-out to the many rivers, lakes and streams in the area. Meanwhile, King Salmon offers 18 modern, comfortable rooms with private baths, two suites and seven guest cabins. You'll never want to leave! Watch as bears stand atop the falls and grab jumping salmon right out of the air. It's a wildlife photographer's and outdoor enthusiast's dream come true. Angry Eagle Lodge & Outfitters offers a totally unique combination of luxury accommodations and superb fishing- you'll have to see it to believe it! The Bristol Bay area in Southwest Alaska offers a wide variety of sportfishing, ideal for both beginning and veteran anglers alike. It isn't unusual for anglers to catch from five to eight species of fish during a week's fishing adventure. Afterwards, rest easy with the knowledge you'll be returning to some of the finest accommodations in Alaska, constructed of cedar logs and featuring six private bedrooms! Angry Eagle Lodge & Outfitters is so remote they don't even have an address! The chef can prepare you a gourmet meal of king crab, prime rib, or inch-thick pork chops! Each bedroom also has a private bathroom and shower. Picture a fat King salmon leaping out of the water just meters from where you just tossed your line in. Your surroundings are equally tranquil and majestic, with water sloshing against the boats bow and immense mountains standing guard in the distance. This doesn’t have to be a fantasy; it happens every day at Great Alaska Adventures! Let Great Alaska Adventures show you and your party the wonders of the Kenai Peninsula. Since 1982, the lodge has been a go-to spot for fisherpeople from all over the world. Their experienced fishing guides are more than happy to show the ropes to newbies while showing veterans the best spots to catch the big one. With the combination of more than two dozen target fish species, 5 nearby rivers and 2 separate saltwater destinations, you certainly won’t be starved for variety at GAA. So grab your rod and reel and hop the next plane to Sterling! Kenai river King salmon, Kasilof river King salmon, Kenai River Sockeye Salmon, Kenai River Silver Salmon and Kenai River Pink salmon combine with world renowned, trophy-class Rainbow Trout fishing and offshore Halibut fishing to create the Ultimate Alaska Fishing experience. The lodge also offers glacier and wildlife cruising, bear viewing, hiking, and whitewater rafting!